We offers quality hunts from 99% to 100% success rate! We specialize in big game. Our promise to you is simple; nowhere will you find a finer guide, outfit or hunt at any cost! Wild Hogs, Guided Salmon Fishing Available. Guided hunts , with my hounds, for Bear and Bob cat. Wild boar hunts on public lands with out hounds.You supply, license, tags,hunting and camping gear,and your food. 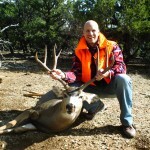 If you are a California Hunting Guides and would like your service listed here, use our Submission Form. It's Free!